Is nick Pope being GULLable towards ufo sighting? Admittedly, this comes from The sun newspaper, not known for its accuracy, but which reports on a ufo sighting in Cornwall, with a image of the alleged UFO. This can be seen in the oh so great, meaningful titled “oooh arrr not alone anymore” (posted 1st january 2007). The image which they blow up for everyone to see (which is helpful,admitedly), is clearly a seagull, (you can even see the wing of the bird in flight, yes its blurred but it’s there). Also its another case of “i didn’t see it at the time, but”…. In the article it mentions “”Nick, formerly the official Ministry of Defence UFO analyst, said: “If I was still there I’d be looking at this very closely. The object looks structured, symmetrical and metallic. This man has caught something very interesting indeed””. What do you think; am i being a bit harsh on this? do you believe its a ufo and why? Why are the newspapers jumping on the ufo bandwagon again; easy… they do not want to know the truth, and couldn’t care less, as long as it sells papers. What it does do, is give us a bad name again. To roughly show why i have come to think it is a seagull…. i have pointed out the features in the photo below (apologies for the out of focus photogragh from the newspaper, and not too well labelled representation). Please also see “cornwall ufo – its a bird damn it“. This entry was posted on January 3, 2008 at 1:49 am	and is filed under are we alone?, extraterrestials, flying Disk, IFO, news, Nick Pope, ufo, ufo in uk. Tagged: The sun newspaper on the ufo in cornwall. You can follow any responses to this entry through the RSS 2.0 feed. You can leave a response, or trackback from your own site. I think one needs to be very careful trying to determine whether or not some footage is genuine. 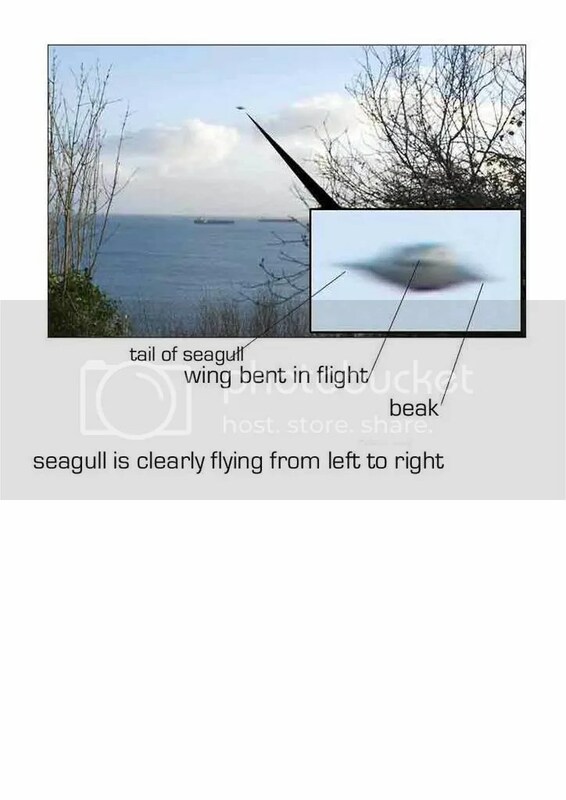 I don’t think it’s “clearly a seagull”, and I don’t think it proofs the existence of UFOs (mass eyewitness reports are better proof since they are harder to manipulate). The “audience” likes pictures and videos. As long as they are not uploaded with the sole purpose of discrediting the ufo community (you know… fabricated “proof” turns out to be anything but a ufo to prove that ufos don’t exist), then I am OK with it. Nick Pope has never seen a UFO….but he is passionately interested. I don’t think it’s wrong or bad to ask the question is he a bit naive sometimes.Yes, he does come across like that with some of the things he says. He seems to like getting attention too and keeps pushing the ‘I was the real life Fox Mulder’ routine. What really bothered me was the way he came onto TV and announced that UFO’s might invade or attack without any explanations as to why he thinks this. Without that information and without knowing him personally I don’t think it’s unreasonable to be suspicious of his motives. Thanks steve for your comments…. i hear you, and can agree to a point… but some of these articles/reports are doing absolutely nothing for ufology as a whole! The bottom line is,they really couldn’t care less about the subject, which is fine by me, but i wish they could just leave it alone (especially after now 2 reports about ufos in less than a week). Thanks for your comments Dh…. Hehe…. Dh (maybe he meant Unidentified Feathered Object). I’m afraid due to national security, we are not allowed to know the difference between a cow and a helicopter…. although a rumour has it that a helicopter has 4 legs. and a well paid Whitehall job… who needs it! although access to all ufo files would be nice.